Turf managers across the Southeast are all aware that temperatures in 2014 have been lower than winters in the recent past. 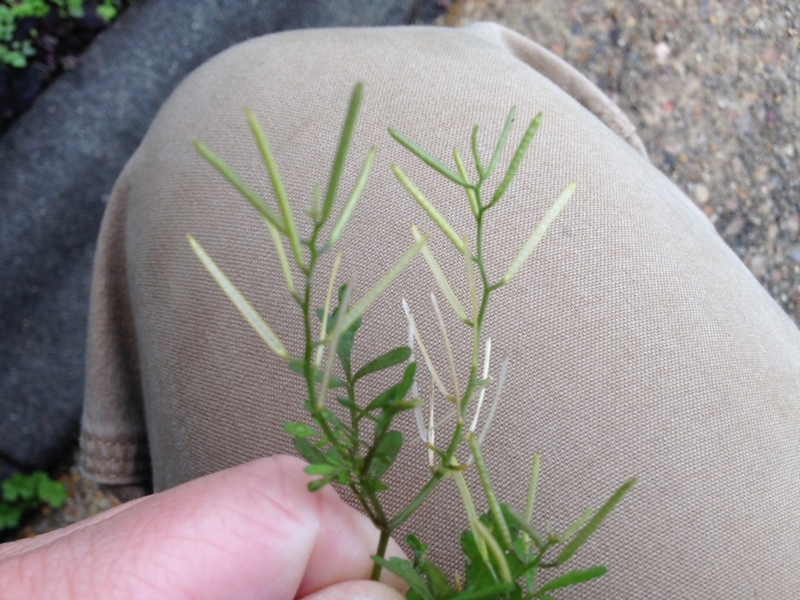 This has brought about renewed concern for winterkill of bermudagrass. Will the turf survive the winter? Will spring green-up be delayed? 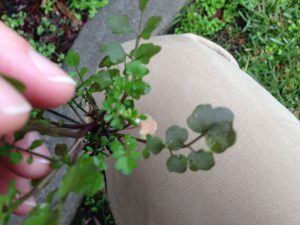 Will replanting be necessary? 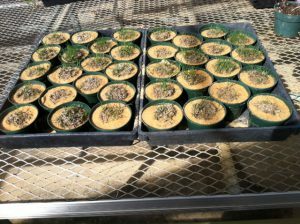 Research conducted at Mississippi State University has shown that newly planted bermudagrass is more susceptible to winter injury than mature stands. Seeded varieties, when planted in May or June, had a better chance of surviving the first winter than when seeded in July through September. If you don’t wish to wait for spring to find out, perhaps there is a faster way to estimate the damage. Bring turf samples indoors today. 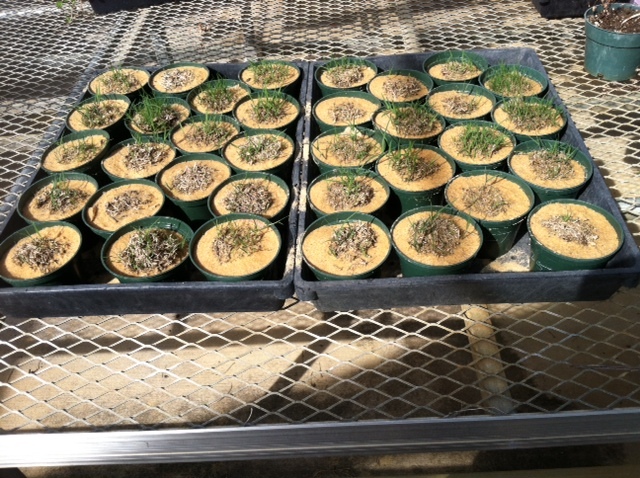 At MSU a new bermudagrass variety trial was planted on June 28, 2013. This experiment contains 35 varieties (17 were planted vegetatively and 18 were seeded). The plots were visually well established before fall dormancy. Then, just like probably many of you in the middle of this long winter, we started anticipating. Our low temperature here was 8 degrees. Will we have to replant? We decided to sample. On February 19 we pulled one two-inch plug from each plot of one block of the field experiment. 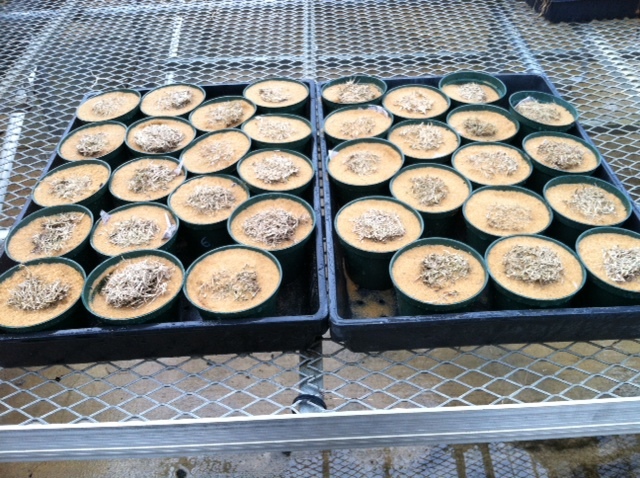 We set these plug samples into pots filled with sand and placed them in a 75 degree greenhouse (photo 1). On February 26, after one week, 31 of the 35 plugs samples were displaying at least one green shoot (photo 2). After two weeks, on March 5, 33 plugs had shown new growth (photo 3). 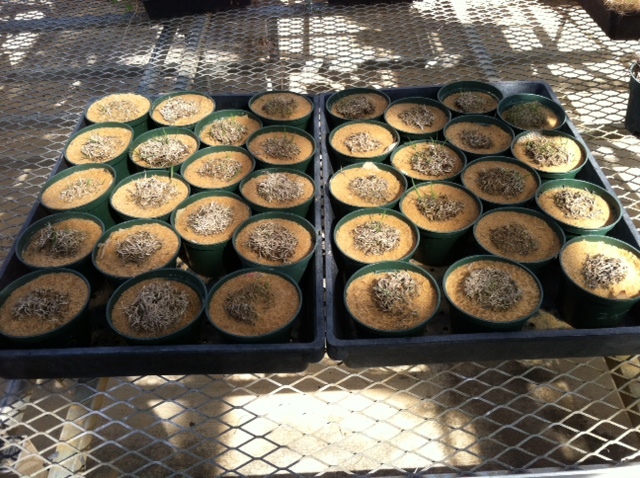 The two samples that have not yet shown signs of life are from seeded varieties. 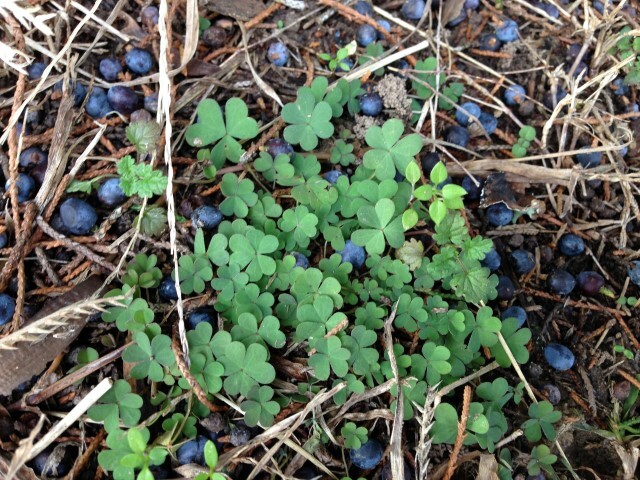 Of course this sampling exercise was not a scientifically valid test for winter survival. The real test will come later on this spring when each entire plot is rated for percent survival. This is a good indication however that the experiment will not need to be completely replanted. We can rest a little easier. Good luck to all you real turf managers out there who are losing sleep over the threat of winter injury. Being a turfgrass extension specialist, I get calls and questions ranging from basic to bizarre – I got one the other day pertaining to growing grass on fish pond banks irrigated with salt water. But the one I get most often is this: “what should I spray on my lawn to prevent weeds.” There’s no simple answer, and the conversation always twists and turns depending upon the person’s agronomic background and whether they have a pesticide applicator’s license. Before I make a recommendation, I try to gather as much information as possible. What type grass do you have? What’s your location? Do you have an applicators license? What it comes down to is usually this: time and money. But that’s not a quick and easy answer like most folks expect. Grow Grass First – I suspect that 90% of the homeowner issues I encounter aren’t going to be solved by applying something from a jug. Proper fertility is important, and so is proper grass selection. But if you’re trying to grow bermudagrass under a live oak, herbicides aren’t going to help. I recommend this publication for a starter guide to homeowners. For coaches and athletic field managers, I recommend managing sports fields in MS. Inevitably, I get asked to come and visit. If it’s an emergency, and you’re dying to know what disease you’ve got, you’d be best off sending some high quality images and a sample to Clarissa over in the diagnostics lab. 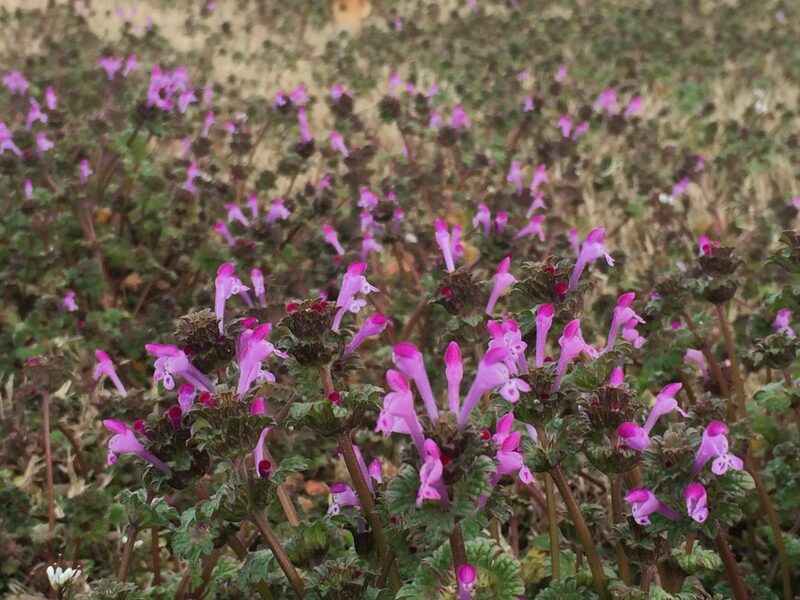 Timing – The issues surrounding spring preemergence are too numerous to mention. 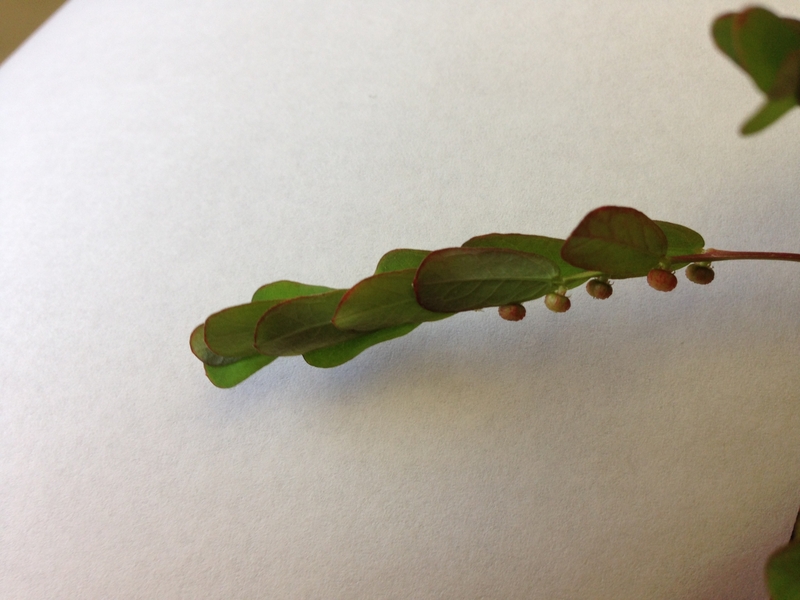 Careers have been built upon understanding the most minute detail of single herbicide chemistries. 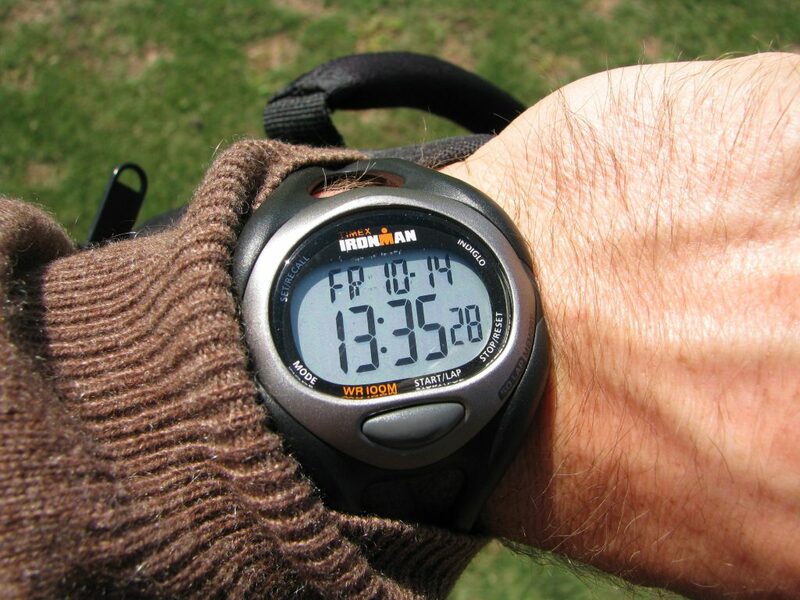 Ultimately, timing is the major obstacle. It’s important to understand that not all pre’s work the same way, and they generally have very limited postemergence activity. 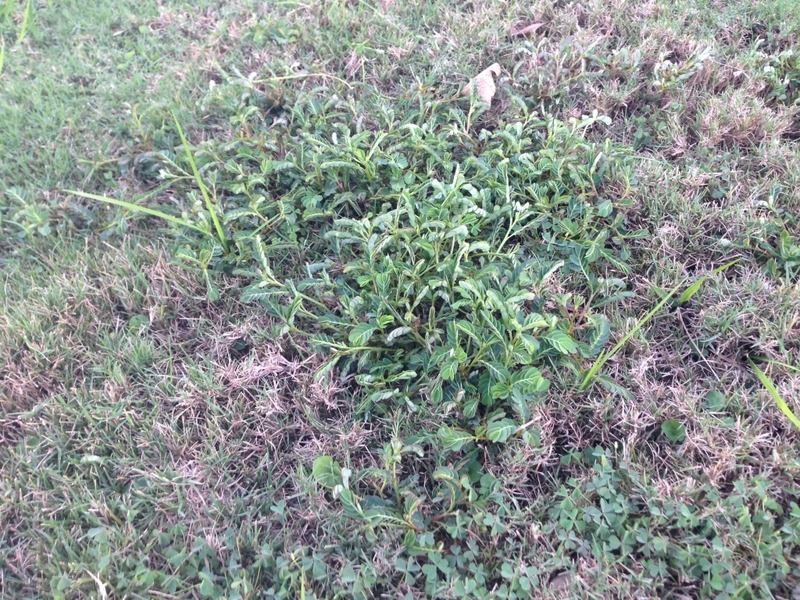 That’s to say, if crabgrass has already germinated, guess what, you’re not going to preemergently control it. For most of MS, it’s not too late to apply a pre. Crabgrass has barely started to break in Starkville, and even if it already has down on the coast, you’ll have germination for the rest of the spring. If you are getting out there late, choose a pre/post combination, such as Barricade (prodiamine) tank mixed with Drive (quinclorac), or choose a herbicide that has both pre and postemergence control, such as Dimension (dithiopyr) or Specticle (indazaflam). Mode-of-Action – If you’re battling resistance, or just trying to prevent it, you ought to be rotating modes-of-action (MOA’s). All of us need to be proper stewards of the chemistries we’ve got. 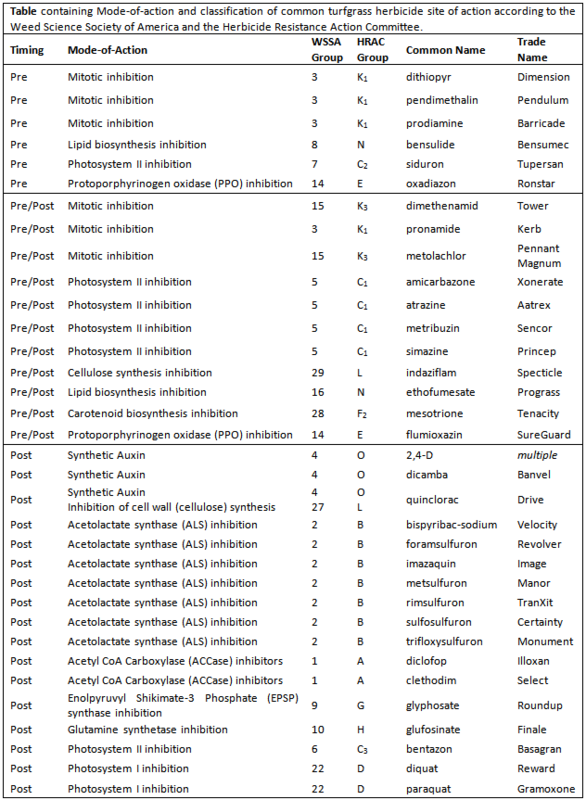 Be aware that herbicides have different MOA’s. That is, they kill weeds differently. Some inhibit photosynthesis (atrazine and simazine); others inhibit cellulose biosynthesis (Specticle); still, others inhibit mitosis (DNA herbicides like prodiamine and pendulum). Here’s a list of common MOA’s. Notice that some are solely preemergently active (Pre). Others are pre/post active. And others are only post. Always read the label when applying any type of pesticide. Keep an eye out for future publications with more detail. And keep in mind that root pruning is a serious issue with almost all of the pre herbicides. 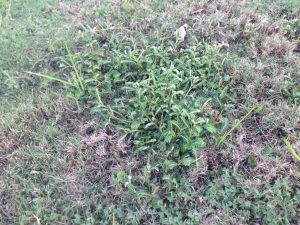 Ronstar may be the safest to new roots of bermudagrass, but it’s expensive. If you suspect winter kill, you might want to avoid applying a pre to bermudagrass if you can keep from it. 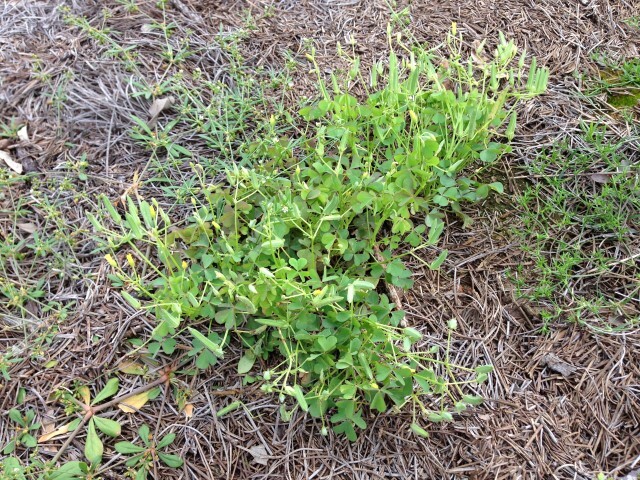 That said, you’ll have very few herbicides available for post control of problematic weeds like goose and crabgrass. Formulation – If I were a homeowner and a DIY’er, I’d choose a granular weed and feed type application. It’s effective, as long as one gets good coverage, and it doesn’t require special spray equipment. DNA herbicides, such as prodiamine and pendimethalin, often come impregnated on both corn cob and/or fertilizer. I don’t typically recommend fertilizer prior to full green up, so buyer beware: fertilizer application isn’t needed until almost 100% green up. Look for the pre herbicide coated on an inert carrier like corn cob or fertilizer free granular. There are numerous other variables, but these are the low hanging fruit. Last updated March 3rd, 2014. Technical problems, contact support.